On Monday, we dream of Tuesday. On Tuesday, we dream of Friday. Wednesday and Thursday are like a bridge we cross, only to realize, when we reach the other side, that we do not remember crossing it at all. If it were not for food and weekends, which make us pause, check in with each other and enjoy the moment, the week would seem endless. All it takes is a first morsel on the plate, the sight of bread announcing the beginning of a meal, which in turn marks the beginning of a satisfying moment in time. Thank goodness, food is at hand. How ironic that the days of the week were probably invented over a good meal (and a lot of very strong wine). 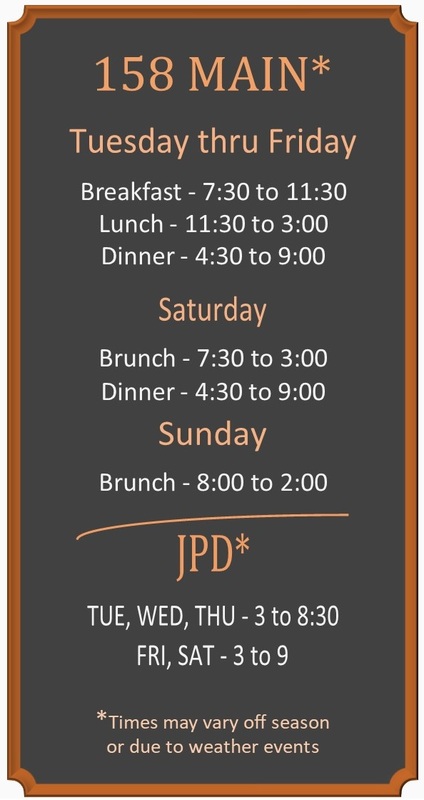 Invent your next great moments over a 158 Main or JPD meal!